Would you like to be more productive, reduce your stress and feel more in control? 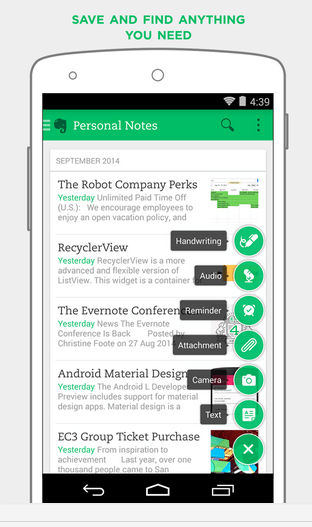 Evernote for keeping everything you need to remember. When was the last time you felt like you had wasted time looking for something because you couldn’t find it right away? So when was the last time…last week… last month… yesterday… this morning…? What would it be like if you could put all of this information in one place, easily searchable, from your phone or computer or tablet (all synchronised and safely saved)? What if you could include a photograph, audio file, screen shot, web page, notes or video to remind you of exactly what you need? And what if this little handy tool is free* to download and use? And what if you could search for it using any text in the note, as well as any “tags” that you created, customized for the way you think about things, the way you remember things? How great would it be if this was also your to do list? This is not all about imaginary what if’s. There is such a tool and I find it indispensable to my business and life. It is called Evernote. I “clip” webpages or parts of webpages to it. I may accompany it with a photo of what I am seeing, including a sign or a screenshot. Perhaps I record an audio message or record a lecture. I can even share the note I have just made. But most importantly, I am confident I will be able to retrieve the information when I need it because I use tags as needed. Now let’s just say that 6 months from now, you are sitting with a friend trying to decide where to go to eat and you think of that interesting restaurant but can’t recall its name or exactly where it is. Maybe you remember which client you were seeing and search for the notes about the client. Maybe you remember the funny stairway and search on that. Maybe you search on “restaurant to try.” You might even have several of these. Any of these memory triggers will get you to the information you want at that moment. When one of my clients asks me a question that requires a little extra research, or tells me that there is something they would like to cover in a future lesson, or calls me to ask me questions in between appointments, I try to make note of this information for future reference. Herein as they say, lies the rub. Evernote is only as good as the information you enter, whether it be visual, text or verbal. So if you get into good habits of making Evernote your universal repository of information, before long, you will will begin to feel like you have it all under control. *Certain Evernote features and services beyond the scope of this article are available on a paid subscription basis. This article originally appeared in Targima, the Magazine of the Israel Translators Association Annual International Convention. I tried to sign up for your blog but it said my email was invalid… Nicely done article! Thanks for sending it. Thanks! I am not sure what the problem was with subscribing. Thanks for letting me know. I just subscribed you, so you should get an email to confirm.